Concert hall, built 1935 by Nils Einar Eriksson. Acoustical consultant: H. Kreuger. Opened 4 Oct 1935. 1985 renovations, modernization, and extension by a functional building (acoustical consultants: Ingemansson Acoustics). 2000 renovations (acoustical consultant: Niels V. Jordan). The complex includes two halls: Great Hall (1247 seats) and Stenhamamr Hall (390 seats). Home to the Göteborgs Symfoniker orchestra. Used for symphonic and chamber concerts. 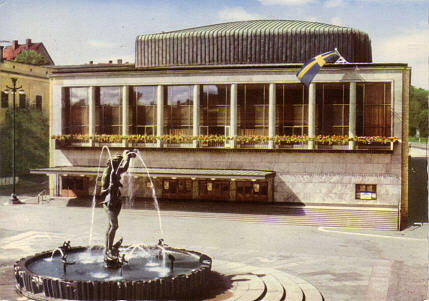 Reverse Text: "Göteborg - Konserthuset"